I have a strange fascination with all things related to the second world war so I was a bit grabby handed when asked to do a review tour for this one. I am so glad I grabbed! 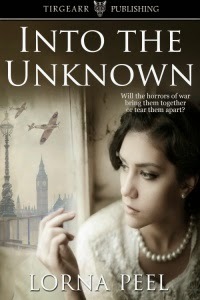 The story commences on the eve of war breaking in 1939. Kate Sheridan is a young nineteen year old from Ireland going to stay with her aunt in London. The world as Kate knew it is about to be changed forever. The start of that is when she meets Charlie Butler, a newly promoted Flight Lieutenant whose family lives over the road from Kate’s aunt and uncle. At twenty seven, Charlie is hesitant at progressing things further with Kate, after a date with her reveals her young age. But with the outbreak of war, normal life takes a back seat and the need to live for today gives a greater desire to take chances when you can. This was a great read with the wonderful love story of Kate and Charlie being interwoven with the background of war, rationing and how the politics of the day were felt. I loved the storyline of the simplicity of love was given greater heed with the complexities of war and how everything seemed more condensed, especially feelings. The atmospheric and historical setting was a fabulous back drop and gave the reader an insight into the 1940s and the difficulties surrounding the era. I was not aware of the hostility in regard to the Irish and it was very thought provoking. With television off the air, people relied on radio and the cinema for information and entertainment. Eighty percent of families in Britain owned a radio (known as the wireless) and besides the news, there were music programmes, talk and comedy shows. "ITMA", short for "It's That Man Again", was a wartime comedy which began in 1939 on the BBC Home Service starring the comedian Tommy Handley. Its name came from newspaper headlines of the time, where the phrase "It's That Man Again" was regularly used as an ironic reference to Hitler. Making fun of Hitler (and the German war effort in general) was the basis of the series. Cinema audiences grew from 20 million to 32 million making 'going to the pictures' the most popular form of entertainment during the war. In between the films, the Pathé News was shown to keep the public informed (and misinformed) on how the war was progressing. Government information films were also shown at the cinema to explain to people how to behave and act during wartime. Music played a huge part during the war in keeping up morale with big bands and swing music all the rage. One of the most admired singers of the time was Vera Lynn, known as The Forces’ Sweetheart, whose songs included, ‘We'll meet again’ and ‘There'll be blue birds over the white cliffs of Dover’. Lorna - Thank you for hosting me, Mandie! Foxylutely Mandie - It's been an absolute pleasure, thank you for sharing this great insight and for writing this amazing book! I really enjoyed the excerpt and look forward to reading the book. Thanks for posting about your book! Thanks for reading and reviewing Into The Unknown, Mandie.